Update: Following reports that France would effectively kill the controversial Nord Stream 2 pipeline, EU officials including German Chancellor Angela Merkel affirmed on Friday that an agreement has been reached which will allow construction of the pipeline to move forward - handing a major victory to Germany and Russia (and a stunning defeat for President Trump). At a meeting in Brussels on Friday, EU diplomats advanced a draft gas-market law, initially proposed in late 2017, while greatly cutting back a provision that would have effectively blocked the pipeline. As The European Union and the US struggle to block the controversial international pipeline project Nord Stream 2, a 760-mile pipeline that would allow Russia to export natural gas directly to Germany - depriving Ukraine of badly needed gas transit fees along the current route for Russian supplies - France on Friday officially announced its opposition to the project, revealing that it would vote with a bloc of EU nations seeking to torpedo the project. Earlier reports suggested that the opposition in Paris is rooted in the fear that the pipeline would confer too much "strategic power" on Moscow, potentially complicating its relationship with Brussels. Reuters has previously reported that Paris's vote against the project could rob Germany of the blocking minority it needs to move the project forward. But later on Friday, German Chancellor Angela Merkel said a deal had been reached on Nord Stream 2. 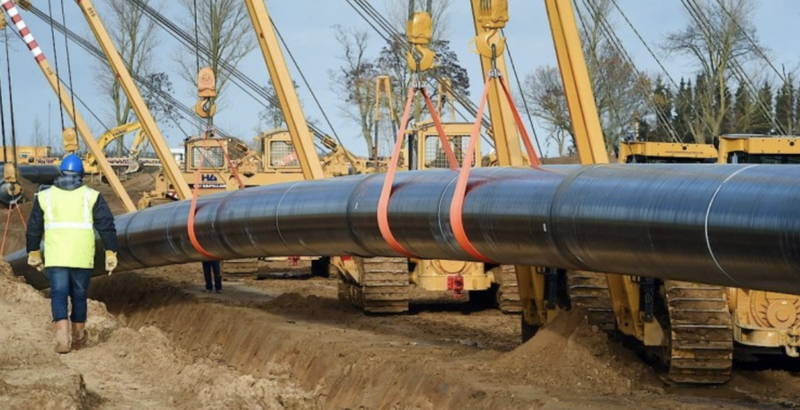 A vote is expected to be held next week on an amendment to the EU's gas directive that could allow the European Commission to cancel the pipeline project, according to Sputnik. The project itself has been spearheaded by Gazprom and five European energy companies, and engineers for Gazprom said recently that the raw pipeline could be finished as early as later this year. Commenting on France’s plans to back the new EU regulations, which could very well torpedo the project, Russia defended the venture, arguing that it is beneficial for all EU countries. Richard Grenell, the US Ambassador to Germany, threatened sanctions last month against German companies working on the project, claiming the pipeline would give the Kremlin too much leverage over gas supplies to Europe (though, more importantly for the US, it could cut into the US's exporting abilities). Responding to France's decision, Kremlin spokesman Dmitry Peskov insisted that Moscow intends to closely follow the discussions in Brussels while continuing work on the project. "We are certainly aware of the discussions that are taking place in the European Union on this matter. We are very closely monitoring the situation," Peskov said when asked whether disagreement within the EU could interfere with the pipeline completion. European countries are divided on the project. Nordic countries like Norway oppose it because it due to the view that it would give Russia too much leverage over European gas supplies (while threatening the market share of Scandinavian energy producers). After Berlin affirmed that it is in "constant contact" with the French over Nordstream 2, Merkel argued against the criticisms of the project, which aims to bring gas into Germany via a route under the Baltic Sea and a hub in Germany. Merkel argued that the pipeline wouldn't make her country dependent on Russia for its energy supplies. "Do we become dependent on Russia due to this second gas pipeline? I say 'no,' if we diversify at the same time," Merkel told journalists in Bratislava, where she met with the heads of states of the Visegrad Group, namely the Czech Republic, Hungary, Poland, and Slovakia. Once completed (that is, if it's completed), the pipeline would deliver 55 billion cubic meters (1.9 trillion cubic feet) of Russian natural gas to the European Union annually. Russian President Vladimir Putin has accused Trump of trying to force Russia out of the European energy market to the benefit of US LNG producers (remember, the US became a net energy exporter late last year for the first time ever, and the US shale industry sees Europe as a key growth market). Moscow also claimed that the pipeline is a purely commercial project. Though clearly, the EU doesn't agree.